The details of the 106th edition of the Tour de France, which will start on Saturday 6th July from Brussels, were unveiled this morning at the Palais des Congrès convention centre in Paris, in the presence of the five times winners Eddy Merckx, Bernard Hinault and Miguel Indurain, who were invited to launch the celebration of the Yellow Jersey’s centenary. The Tour de France 1919, which witnessed a return to cycling after four years of world war, in fact set off the day after the signing of the Treaty of Versailles and symbolically emerged from the gloom, guided by the light of the first Yellow Jersey awarded to Eugène Christophe on the morning of the Grenoble to Geneva stage. One hundred years after this renaissance and birth, in the same vein, the Tour de France will be celebrating the fiftieth anniversary of its first encounter with the greatest cyclist of all time, who wrote his name on the race’s roll of honour for the first time in 1969. Indeed, it is in Brussels, in the country of Eddy Merckx, that the pack will come together for the 106th edition, which is set to awake the winning instincts among the pretenders for the distinctive jerseys and the 21 winner’s bouquets on offer along the 3,460-km route in 2019. On leaving Belgium, the battle between sprinters could continue in the Champagne and Lorraine regions, but climbing skills will soon be called upon among those hoping to get their hands on the Yellow Jersey, who now are used to vigorously testing themselves against each other at La Planche des Belles Filles. They will have to remain in the same state of mind on the way to Saint-Étienne and Brioude, watch out for any big breakaways on the way to Albi and then Toulouse, as well as preparing for a remarkable battle in the Pyrenees. After the time-trial in Pau, the climbers will have the opportunity to hit back against the specialists against the clock when the race tackles the Col du Tourmalet pass, which will signal the start of a festival of summits. In the space of a week, they will face an unprecedented climbing programme, with five mountain stages including three that will finish at an altitude of more than 2,000 metres: on the Giant of the Pyrenees (2,115 m), then in Tignes (2,113 m) on a stage that will culminate at the Col de l’Iseran pass (2,770 m) and finally in Val Thorens (2,365 m), the day before the finish in Paris. In the meantime, the riders will have also experienced a day in the Alps of the highest standard, with the ascents of the Col de Vars (2,109 m), Col d’Izoard (2,360 m) and Col du Galibier (2,642 m) passes before a dizzying, vertigo-inducing descent into Valloire! Ø The details of the 106th edition of the Tour de France, which will start on Saturday 6th July from Brussels, were unveiled this morning at the Palais des Congrès convention centre in Paris, in the presence of the five times winners Eddy Merckx, Bernard Hinault and Miguel Indurain, who were invited to launch the celebration of the Yellow Jersey’s centenary. Ø Among other aspects, the route in 2019 holds a tough mountain programme in store, with three finishes above 2,000 metres in altitude, at the Col du Tourmalet pass, Tignes and Val Thorens, which is unprecedented in the history of the Grande Boucle. 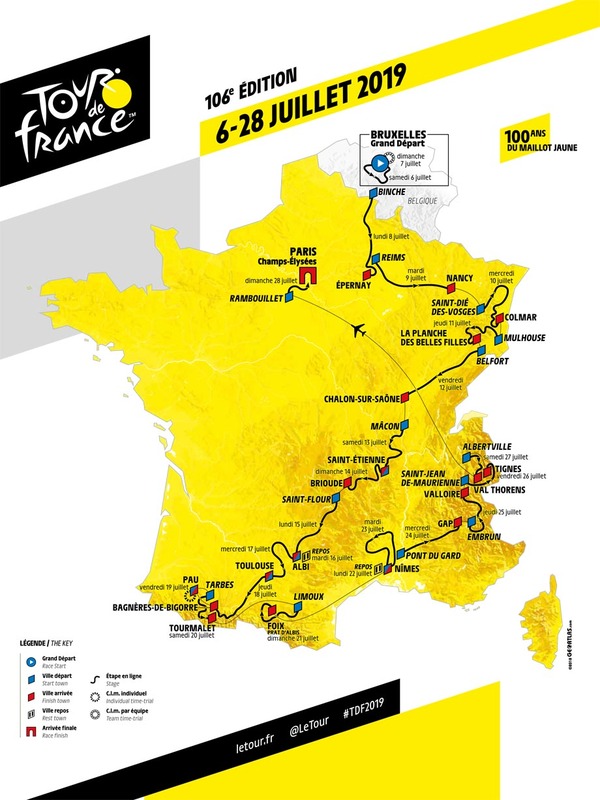 Ø The 6th edition of La Course by the Tour de France will be organised in Pau, on a route specially designed for punchers. Five years after the creation of La Course by the Tour de France, which brought together the world’s leading women cyclists in Paris in 2014, the women’s elite pack will do battle on the time-trial route in Pau. However, unlike their male counterparts, the ladies will ride the loop on the programme five times, for a circuit measuring 120 km in total. It will be rendered especially dynamic by the presence of the Côte d’Esquillot slope, an ideal springboard for the most explosive riders. 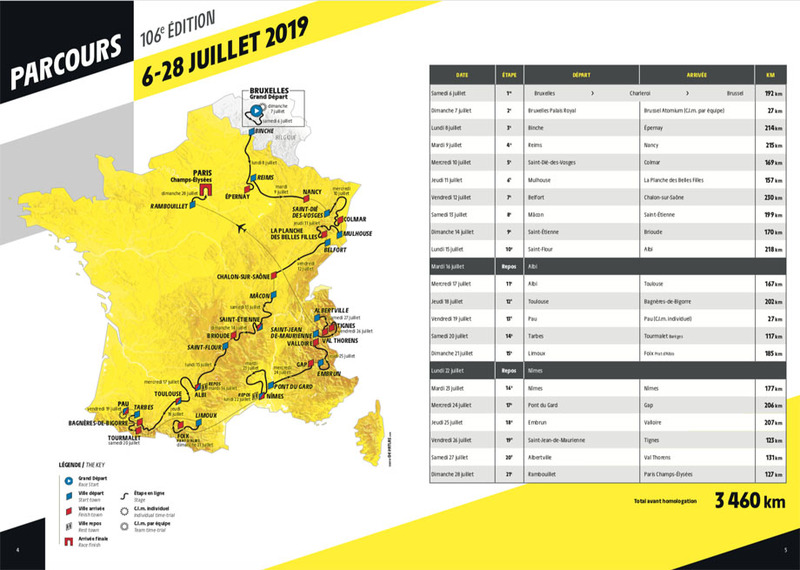 After the sprinters on the Champs-Élysées, the climbers on the Col de l’Izoard pass and then at Grand-Bornand, this time the punchers will be in the limelight. The most prestigious cyclo-sportive event will take place on 21st July, on the route of the 20th stage between Albertville and Val Thorens. The 15,000 amateur riders expected to start will tackle a total positive gradient of 4,563 metres before reaching the highest resort in Europe, which will also play host to the highest finishing line in the event’s history, with an extra five metres compared to the finish at the Col d’Izoard pass, reached by 11,000 cyclists in 2017. Registration will be open from Monday 29th October at noon via the time to platform. Click here to discover the 2019 teaser.